Infrastructure improvements also include personal watercraft launch area. CORONADO — Major construction brings one San Diego area boat launch ramp to a near grinding halt, all while Coronado city officials and port district staff christened a similar venue nearby. Coronado and the Port of San Diego officially re-opened Glorietta Bay’s upgraded boat launch ramp, July 17, giving local boaters and personal watercraft users a modernized venue with new amenities. The opening of Glorietta Bay’s boat launch ramp coincides with the near closure of a similar venue at Shelter Island; the 10-lane boat launch ramp in San Diego was whittled down to one lane for the summer as port district officials began construction work on planned upgrades there. Coronado was the lead agency on the $1.29 million boat launch ramp renovation. The ramp’s concrete apron was replaced while an adjoining boarding dock was expanded. Upgrades were also made to the free public dock (made ADA compliant) and parking lot (resurfaced). New additions at the boat launch ramp are a non-motorized craft launch area, sandy beach and a boat wash-down area. Repairs were also made to an area of riprap and a storm drain. A ribbon cutting ceremony was held July 17 at the Glorietta Bay boat launch ramp. Upgrading the boat launch ramp was part of a larger – and final – phase of construction at Glorietta Bay, which also called for the replacement of the marina’s Dock C.
“Dock C improvements consisted of redevelopment, reconfiguration and extension of the previous dock system in order to meet current fire and electrical code requirements, as well as ADA and boating design standards,” port district staff said in a press announcement. 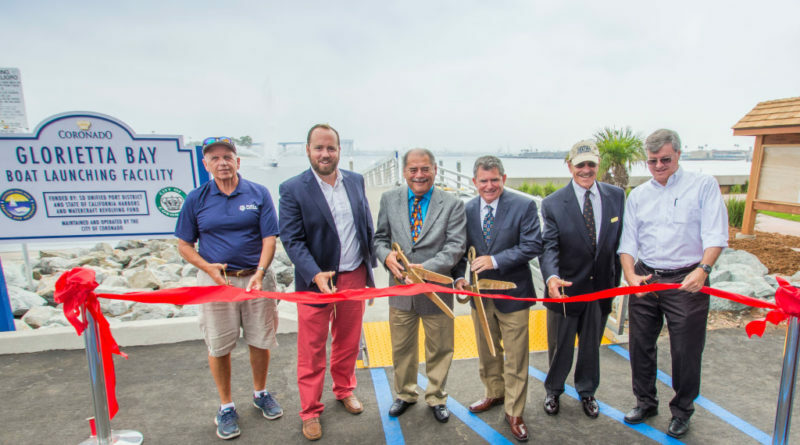 The ribbon cutting ceremony included boat launching demonstrations and rides from the launch ramp to Dock C.
Funding for the boat launch ramp upgrade came from the city of Coronado ($150,000), Division of Boating and Waterways ($670,000), and the Port of San Diego ($470,000). Glorietta Bay’s sole boat launch ramp, built in 1969, was shut down in February to allow for construction to take place; Bellingham Marine was hired to complete the project. Located across from the boat launch ramp is a 72-hour anchorage; boaters can obtain a permit for the anchorage from San Diego Harbor Police. The speed limit from the boat launch ramp to San Diego Bay’s main channel is 5 miles per hour. Boaters navigating out of Coronado are advised to pay attention for shallow areas adjacent to or just beyond Glorietta Bay. Work on the boat launch ramp was part of a long-term, phased upgrade of boater amenities at Glorietta Bay Marina. Docks A and B were upgraded a few years ago; the wooden docks there were removed and replaced with concrete equivalents. Dock C and the boat launch ramp were the final two portions of the marina to be upgraded. About 100 boats can be docked at Glorietta Bay Marina’s three docks.